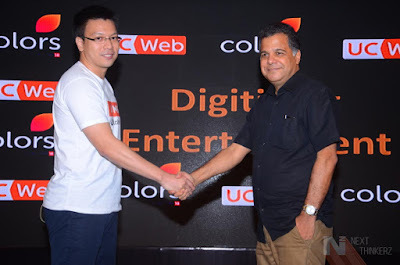 UCWeb launches a refreshed New UC Browser with Colors Partnership & We-Media. About two months ago, Alibaba's UCWeb had debuted their official event in India explaining their next big bet and launching a news segregating platform to the masses. UC News was launched as a platform to help create opportunities for Individual Bloggers & Media to help them expand their work in the hands of the millions. Today after exact two months, UCWeb has few more updates to announce on their recently announced products, So let's dive deep and know everything in detail. To have a basic birds eye view, UCWeb today launched their new UC Browser with the new updated Logo and announced their partnership with Colors entertainment. UC Browser - An app loved by the Users, hated by the Media. Why does Media hate it? Well certainly because it blocks the entire ads/Revenue part, that an influencer earns via the clicks his readers make on his blog. Well, Folks at UCWeb say that's the reason why they made UC News, where Influencers would get a chance to monetize their blogs via UC's content curation platform. But is that any Good regarding an Average Blogger? Probably not, because ads are the primary reason, how a website owner earns. That was also reflected in today's event, As many media people didn't turn up at the event. Since UCWeb has their plans to lock up users under their ecosystem leveraging today's needs, which is getting information on your fingertips, It's working. So the new Updated UC Browser has a new Logo at first glance, Which now has a Deer logo instead of the previous squirrel one. Then we have got the UC news mashed up inside the UC Browser itself, which provides your selected news feeds based on your preferences. So let's say you're using the UC browser app, You don't need to juggle constantly between UC News and Browser, As the relevant info would be displayed on the home screen of the browser. Once you select your preferred niche, Relevant info should be posted to you based on your search results. That again is available in English, Hindi and would soon be available in Tamil & followed by other regional languages over time. Over 80 million people prefer to use this app monthly for their basic surfing needs, More specifically because of the faster internet access capable on lower bandwidth due to UC's superior data compression techniques. Today marks the day where, UC Browser stands as the No. 1 independent browser in India & Indonesia, Whereas it ranks in world’s top 3 mobile browsers, claimed by StatCounter. Design wise UCWeb have made it easy to access and make it look simple concerning usability. It features a clean UI with easy to navigate gestures to switch directly from browser to news section. Also, we're already familiar about the Night Mode situated within the new app. The folks at UCWeb also announced their content partnership with Colors TV pushing the boundaries of Digital Media. According to a detailed survey of focused keywords, they have jumped on to this conclusion to partner with Colors TV. Due to this partnership, Any user is eligible to watch four specific shows of Colors, i.e. ; Jhalak Dikhhla Jaa, Big Boss, 24, & Comedy Nights Live. Expect some high pop-ups regarding the reminders for these shows. Manish Paul who hosted today's event will also helped UCWeb spread their word via his own exclusive UC blog. Here you have got the privilege to get behind the scenes info from Manish Paul, and the 24 TV series game would soon be launched on 9Apps. It is yet another content curation platform but this time, you can contribute your articles here, It doesn't mean that, to be a part of this you need to be an influencer or some celebrity. UCWeb themselves have hired Manish Paul, Chetan Bhagat, Lauren Gottlieb & many more people. More details on how to apply would soon be shared here, so stay tuned. So what are your thoughts about this? Are the services launched/refreshed any Good? Are you an active user of UC Web? Let us know in the comments below.